On April 24, 2007 – the 17th anniversary of Hubble’s launch – the Space Telescope Science Institute released a devastating picture of the Carina Nebula, a ridiculously complex and gorgeous star forming region about 7500 light years from Earth. Any structure with that kind of detail in it is going to spark your brain, making you see all sorts of things in it like faces, animals, and so on. This is called pareidolia, and is one of my favorite things of all time. It’s so fun, in fact, that the folks at the Institute are holding a monthly contest which they call the Hubble Heritage Creative Challenge [Facebook link], and this month’s contest is to find examples of pareidolia in the Carina Nebula. They have a few that have been submitted already on display. It’s not hard to find things in the nebula. Either click the image above, or just go to the Hubble site with a zoomable image of Carina and start panning and scanning! You’ll find tons of stuff. In fact, in a post I wrote back when this image was first released I pulled out some choice objects to discuss, and one of them is the famous finger you see here. I wouldn’t suggest submitting it, though: the judges may rule against you prejudicially given the attitude conveyed. But if you find something good, you can win a print of a Hubble image! The artwork with the most "Likes" will win. But hurry: the contest ends October 19. Thanks to my friend Tiffany Davis at STScI for letting me know about the contest. Licinia is about 25 km (15 miles) across – too big to fit in Dawn’s field-of-view from that height. But it does show spectacular detail, including what look like landslides into the bowl from the crater rim; you can see them as dark streaks running down the crater wall. Mounds of material at the base of the crater wall indicate bigger landslides, too. Vesta’s gravity is far weaker than Earth’s – it’s about 1/40th what we experience here – but even then, it’s a force that won’t be denied. While I was inspecting the crater floor, I saw something that made me laugh out loud. The floor is lit by the distant Sun, but a sharp shadow of the crater rim is cast on it as well. The inky black shadow is irregular due to the uneven crater rim. Inset here is a piece of that shadow line. Do you see the dark shadow "face" looking to the left at the top? It jumped right out at me… and then I saw another face just below it, this time bright and looking to the right and slightly up! Man. Pareidolia is a force almost as strong as gravity. Anyway, Dawn’s visit to Vesta has come to an end. It left the asteroid on September 5, and began the long two-and-a-half year voyage to visit Ceres, the largest of the main belt asteroids between Mars and Jupiter. Vesta is a fascinating place, but so is Ceres, and we know very little about it. That’s all about to change. But then, that’s what exploration is for. The picture was taken by Todd Terwilliger, and I had a bit of a time tracking it down! Anthony Mills sent me a tweet about the picture, but that went to a "Picture of the Day" kind of site. I used reverse Google image search, but that returned dozens of sites and blogs that had used the image without permission or a link to the original (grrrr). I dug a little deeper, and eventually found Todd’s page on Flickr. I sent him a note and he kindly gave me permission to use it. So I make this plea: when you use a picture form the ‘net, please please please give credit and a link to the original source! It makes life a lot easier for folks like me who like to share fun stuff, and it’s the right thing to do. It’s very pretty, isn’t it? 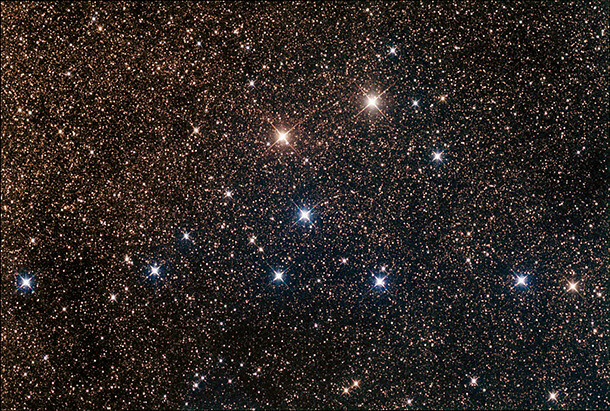 The asterism itself is composed of the ten or so brightest stars you see; the rest are background stars. It’s most likely not a true cluster; that is, the stars may be at different distances and not physically associated with one another. Still, this so happens to be one of my all-time favorite objects in the sky. Why? Because of the shape of the cluster: it really looks like a coathanger! If you don’t see it, I drew lines between the stars in question in the image inset here. Now you see it, right? Astronomy Picture of the Day featured a different shot of the Coathanger in 2008, too, which is worth a look. This group of stars is pretty big – three times the width of the full Moon on the sky – and bright, making it really easy to spot with binoculars. In fact, when I was younger I stumbled on it myself by accident while scanning that part of the sky with my telescope. It was obviously shaped like a coathanger, and I was delighted to find out that’s what everyone called it. In fact, now that I think about it, it’ll be very well placed for observing in September, making it a great target for folks coming to Science Getaways. That would be fun. But if you have clear skies this time of year, it’s easy to find, about a third of the way from the bright star Altair to Vega, in the Summer Triangle. Give it a shot! Image credit: Anthony Ayiomamitis, used with permission. André — who’s Dutch — put this up with the caption "Er zit een draak achter ons aan!" — "There’s a dragon after us!". That’s a funny pun, given the name of the capsule that was already on its way there. But he didn’t say what this feature was! I wanted to find out, and wound up with a fun story. Because I was curious, I first read the comments on the Flickr page for this picture. Flickr use PC101 said it was Lake Puarun in Peru seen at an oblique angle. I looked on Google maps, and there’s a decent resemblance. But it didn’t sit right with me. I couldn’t get enough landmarks to match up between the two photos, so I investigated a bit more. So I went back to Google maps, looked over Australia, and within about a minute found a suspicious-looking dry lake bed called Lake Rason. I zoomed in, and, well, here be dragon! I rotated this screenshot to more or less match the orientation of the one from the ISS, and clearly this is it. Funny, too: the "tail" is even longer than in the ISS picture, making it look even more like a serpent! Now think about that. All I had to go on was a picture taken on board the space station and the time it was taken. I didn’t know what direction André took the shot, what magnification he used, or anything like that. All I had was the time he took the picture, and access to the internet… and a bit of experience knowing where to go to get more information. And within a minute I had my answer! I could see plainly where and what this was. Interestingly, if the timing in the header is accurate and it was exactly 05:58 UTC, then the ISS was nearly directly over the lake when this picture was taken! You can see that for yourself: click here to see the map of the area where I’ve added an arrow to mark the position of the ISS at the time. The lake is in the middle, and looks upside-down. Keep in mind, the ISS is screaming around the planet at 8 km/sec, so being off by a minute can mean a different of 500 kilometers. Incredible. So there you go. Seek and ye shall find! And nicely, the Dragon spacecraft found the ISS just a day later, and made history. André has lots of pictures of that as well, which you can find on his Flickr page. Go check ’em out… and if you find something you don’t understand, why, now you know what to do. Ha! This is a great example of audio pareidolia; hearing (instead of seeing, as it’s usually done) some recognizable pattern in a completely unrelated series of noises. It helps a lot if you’re cued in some way to hear it with subtitles. In this case the title of the Neatorama post had me listening for the words "I don’t want to", but I think I would’ve heard it anyway. But I wonder: if they were going to a dispensary and asked the cat what they were getting, would you hear "marijuana"? Check out the posts below for more of this sort of thing. The first one still makes me laugh. What a shot! Dead center in the picture is the Pleiades, the small cluster of bright stars. The bright object is the Moon, and to the lower right is Venus. If you look carefully, just above the horizon, lies Jupiter. To see it, start at the Pleiades, let your eyes move down and to the right to Venus, then keep going; Jupiter is in line with the clouds, just at the edge of the aurora itself. I love how that one long swooshing ribbon of aurora cuts across the whole picture. See how it looks broader to the left, then narrower as you follow it to the right? That’s almost certainly perspective making it looks smaller. It’s probably something like 100 kilometers (60 miles) above the Earth’s surface and follows the Earth’s curve. The far end of it, near the horizon, is much farther away than the part at the upper left. And despite all the drama occurring in the sky, my eye keeps getting drawn to the water. In this 10 second exposure, the slow movement of the water softens its appearance. Funny, too: I saw a face in the water and chuckled, then noted that Mortensen got a note from a friend who saw the face as well… or maybe a different one. But the one I see is pretty obvious. Do you see it too? Mortensen has many more beautiful shots of aurorae on his 500px page, so head over there and soak up the glory of the active sky. Image credit: Helge Mortensen, used by permission. The Sun is feisty. Rising and falling packets of ionized gas (called plasma) below its surface generate fierce magnetic fields, which store vast amounts of energy. This can give rise to such features as sunspots, explosions like flares and coronal mass ejections, and huge, towering plumes of plasma called prominences. Wow! Alan estimates that at its peak the eruption was 150,000+ kilometers (100,000 miles) in height — compare that to the size of the Earth, a mere 13,000 km (8000 miles) in diameter. Yowza. Image credit: Alan Friedman, used by permission; The Simpsons™ & © Twentieth Century Fox Film Corp. All Rights Reserved. Used under The Fair Use Act. And yes, I’ll admit it looks more like Abe Simpson than Burns, but if I used Abe I could’t write the headline I did. And the nose is definitely Burns’. Also? BURNS. Because it’s hot. So clearly this was the correct choice. And I certainly hope this research yields insight into how to fight cancer. I’d love to see that smirk wiped off that nucleus’s face. I always pictured him as somewhat bigger. The part of the brain they were imaging? The hippocampus. Eh, close enough. Happy holidays to all, and to all a clear night!